Print & Share is a simple, elegant iPhone app that enables you to print e-mail, attachments, images, contacts, documents, and Web pages to any network-connected printer you’ve made accessible via its free sister program, WePrint. Provided by EuroSmartz, WePrint is a print server that comes in both Mac and Windows versions. Like the iPhone app it supports, it’s stable and easy to set up. Multifunction Printer: Print & Share enables you to print multiple images simultaneously and also to choose the image print size from the iPhone. Print & Share is more versatile than Print ( ), EuroSmartz’s first (and, at $1, cheaper) offering. That app doesn’t enable you to print e-mail, attachments, and documents. Since we reviewed Print, EuroSmartz has added some nice options to Print, which are included in Print & Share, as well. For example, you can now password-protect WePrint, which requires you to type in a password before accessing the server software. The app now allows you to override, from your iPhone, your default WePrint settings for image size and orientation. As in the original version of Print, you can choose a WePrint setting that enables you to print documents to a file. When you choose this option, your iPhone documents—whether they’re Web pages, PDF files, images or contacts— how up on your WePrint server as Preview documents. All of Print & Share’s action takes place within the app itself, which means if you want to print out e-mail, for example, you have to open up Print & Share and access your e-mail from within the app. The home screen presents a simple interface displaying six icons—for files, e-mail, Web pages, contacts, images, contacts, and camera. When you tap on an icon, the app then lets you access each type of item. Because it is pulling the files from elsewhere, you can preview them but not edit them in any fashion. 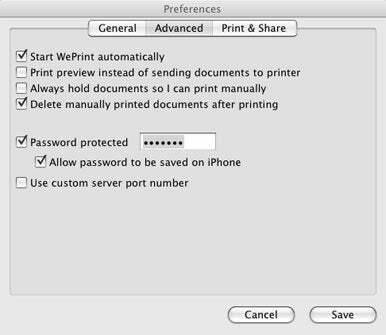 Protect Yourself: The WePrint server software advanced preference pane enables you to set a password and to automatically have documents appear on your host computer as preview files instead of printing. You can also select multiple noncontiguous files, contacts, photos, and so forth to print out as a batch. Unfortunately, each file—whether a 20-page Word document or one line of contact information—prints out as an individual entity. This means, for example, that you can’t print a list of contacts and contact information as a single document on one page. To print Web pages from Print & Share, you have to first open the app’s built-in browser and then type in a URL. The browser does let you bookmark pages, but because of iPhone limitations, you can’t import your Safari bookmarks. The browser itself isn’t quite as elegant and robust as Safari, but it’s quite capable and stable, and if you do a lot of printing it’s solid enough to serve as your primary iPhone Web browser. The “sharing” aspect of Print & Share enables you to save iPhone files to your remote server’s “WePrint Files” folder and copy files that you’ve stored in that folder to your iPhone. It’s a very nice feature, enabling you to view PDF, Word, Excel, and other common file types in both landscape and portrait mode; you can also zoom in and out for easier viewing. The app provides a few basic commands that allow you to copy files to and from your computer, rename and delete files, and put files into folders. You can also create and edit simple text documents from within the app; the text editor works in both portrait and landscape mode, providing a wider on-screen keyboard for those who prefer that option. Although there are some limitations to Print & Share, these are largely due to restrictions imposed by the iPhone operating system. Unfortunately, while the iPhone and iPod touch have been marketed as, and clearly are, pocket computers, Apple decided not to make the “print” function a standard and ubiquitous part of the OS. Although Apple’s decision is a puzzler, Print & Share is a surprisingly elegant makeshift solution to a problem that shouldn’t exist. Print & Share is compatible with any iPhone or iPod touch running the iPhone 2.1 software update.